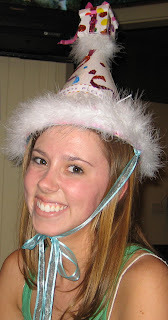 This is my daughter, Maeagan, wearing the family birthday hat on her birthday. Now I ask you, how could any man inflict violence on this?! It's time for real men to prove their manhood by the conquest of their own hearts and not by inflicting their inabilities on others. Do you hear me Taliban, Child Molester, Pornographer?! A Knight swears to protect those in his care and to put honor above all. Today I am especially proud to be a Knight of Moleskine, Spirit and Ale!